Company: This African cichlid species can be kept in a community aquarium with other peacefull species..
Aquarium setup: Should be kept in a well planted aquarium. Provide flats rocks as spawning substrate. Create hiding places for the fishes among roots, caves and plants. Feeding: Accepts flake food as well as most other food types. 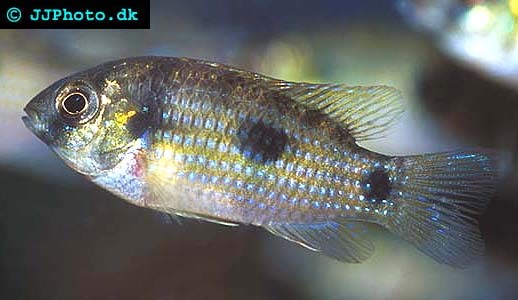 Breeding: This cichlid species is very easy to breed. They will lay their eggs on a stone that they have cleaned in advance. The parents guard their eggs and fry. The fry should be feed brine shrimp the first few days.